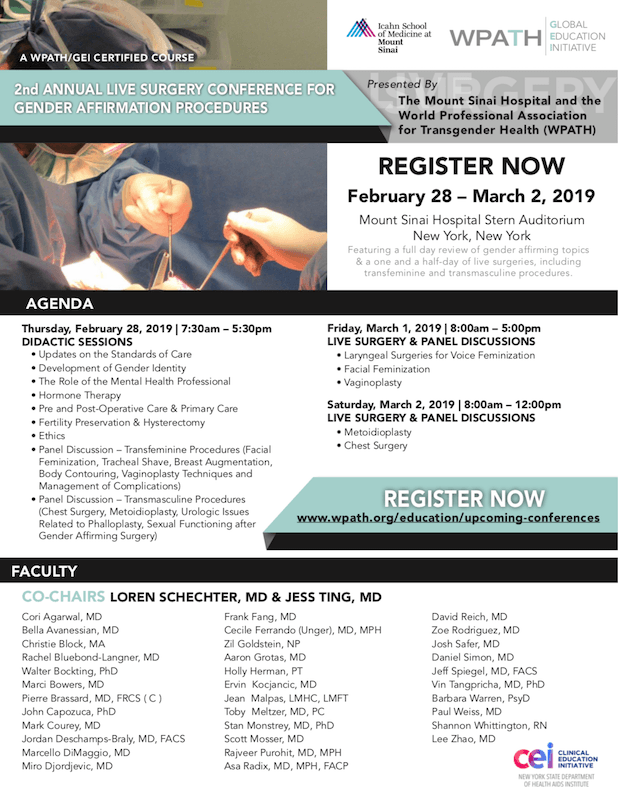 In late February 2019, The Mount Sinai Hospital and the World Professional Association for Transgender Health (WPATH), celebrated the 2nd Annual Congress for Gender Affirmation Procedures at this prestigious university hospital in New York City. 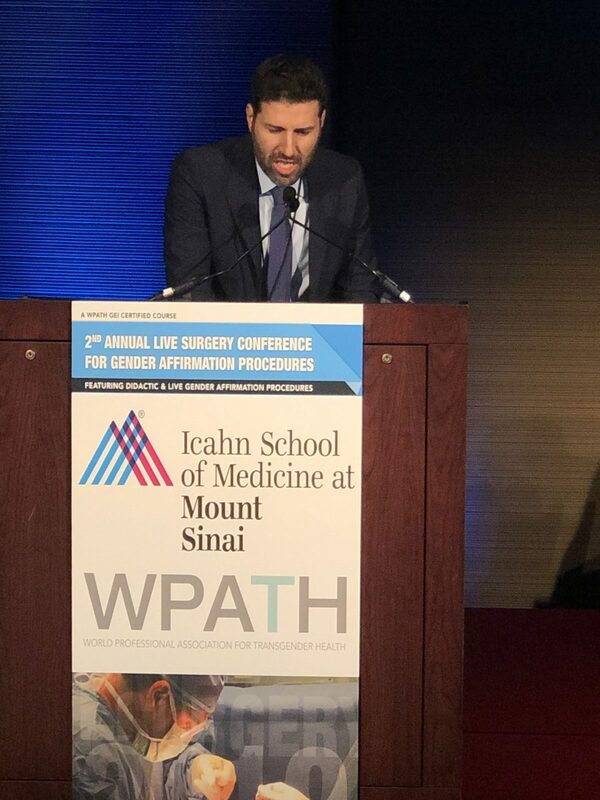 The discourse by the president of The Mount Sinai Hospital since 2013, Professor of Anesthesiology David Reich, explained how the event marks an important moment: the evolution of gender surgery in the USA, which continues rapidly on an upward learning curve. Despite the increasing interconnectedness among professionals in the United States, more international links are necessary in order to stimulate further advancements in all areas of trans healthcare. Multi-national discussions should occur more frequently on hormone treatments, psychological and social support, surgical options and techniques, ethical considerations and more. The landmark event at Mount Sinai brings together leading medical providers in gender affirming treatment from around the US and beyond. Apart from the biannual WPATH Symposium (World Professional Association of Transgender Health) and the regional sub-chapters in the U.S. and Europe such as EPATH and USPATH, this remarkable congress is one very few opportunities in the world where experts converge to share experience and impart knowledge to a surging generation interested in trans health. 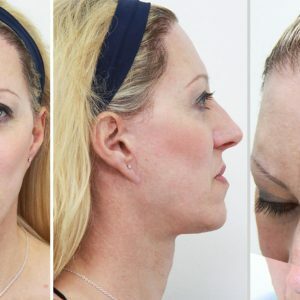 Dr. Daniel Simon, co-director and co-founder of FACIALTEAM, was invited to speak again for the second consecutive year regarding the most recent advancements in facial feminization surgery (FFS). His lecture was based on the experience of his multidisciplinary team specialized in facial gender affirming procedures with over 1,200 patients. 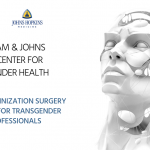 Dr. Simon forms part of a research group on facial feminization surgery, which has been spearheading FFS training & education workshops and programs since beginning the “TransHealth Initiative” in 2014. 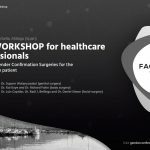 Thanks to the participation of pioneers such as Prof. Stan Monstrey, Dr. Marci Bowers, Dr. Preecha and Dr. Jens Berlis, the Training & Education activity of FACIALTEAM has launched a FFS Training Program in Marbella as well as a gender surgery symposium in conjunction with Johns Hopkins University’s Gender Surgery Department in Baltimore. The complexity of the field of gender affirming procedures requires the cross-collaboration between various expertise, a true multi-disciplinary effort. 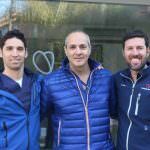 Conferences such as Mount Sinai Hospital’s is fundamental to the advancement of the sector, functioning as the necessary nurturing grounds for a myriad of innovative activity in the field. Thanks in part to professional networking opportunities such as this, FACIALTEAM has a growing involvement in international research initiatives. This type of exchange of ideas on developing better approaches in all aspects of transgender patient care is what will ultimately benefit our patients. At this year’s second annual event, there was an increase turnout of both medical students and expert presentations. Notable leaders in their field involved in the congress are former TransHealth Initiative collaborators, Dr. Marci Bowers and Prof. Stan Monstrey, acting moderator at the event and former president of WPATH. 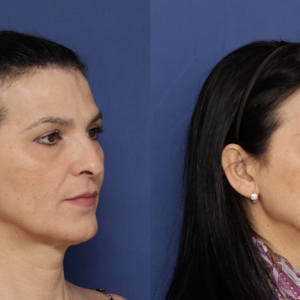 We would also like to extend special thanks to the surgeons Dr. Rebecca Bluebond-Langner, Dr. Jordan Deschamps-Braly and Dr. Marcelo Di Maggio for their contributions in discussions on Facial Feminization Surgery. Also, it should not go without mention the crucial, diplomatic organizing efforts of Professor Loren Schechter. In summary, the seeds of future changes in the field.